Here are the Messages given to me and the Prophet, Maria Divine Mercy of Ireland, regarding this matter. 3 July 2007 (LP) – Jesus: When the curtain falls upon Pope Benedict, the world will go into total darkness. 1 January 2009 (LP) – Jesus: Pope Benedict will be removed and an Evil One shall take his place. 8 December 2012 (LP) – Our Lady: The Holy Father soon will be removed. 1 February 2013 (LP) – Jesus: Pope Benedict to undergo Calvary; Pope Benedict removed by the False Prophet – Evil One to take his place. 14 February 2013 (MDM) – Jesus: My Vicar has fallen – My Church will fall. 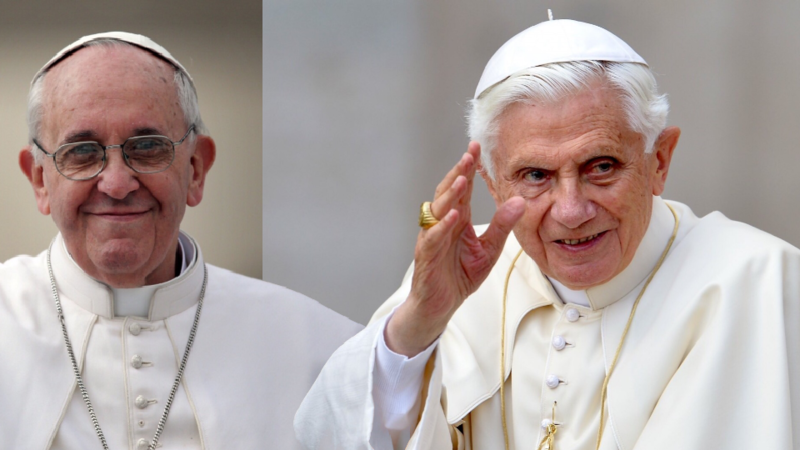 15 February 2013 (LP) – Jesus: Pope Benedict forced to abdicate; False Pope to be placed upon the Throne. 16 February 2013 (MDM) – Jesus: The departure of Pope Benedict marks the beginning of the end. The False Prophet will now take over. 19 February 2013 (MDM) – Jesus: My Vicar has been viciously ousted. 22 March 2013 (LP) – Jesus: Benedict only true Pope at this time. 1 April 2014 (MDM) – Jesus: Pope Francis will change the laws. 18 May 2013 (LP) – Jesus: Pope Benedict will leave the Vatican soon. 31 May 2013 (LP) – Jesus: The False Prophet, Pope Francis, will call a new Ecumenical Council, to change the Laws in the guise of a Church of Poverty – a Church of the People. 21 July 2013 (LP) – Jesus: All men will know that the one who sits on the Throne of Peter does not come from Me. August 2013 (LP) – Jesus: Pope Francis – the False Prophet. You have been inspired by the Holy Ghost to write to Francis, who sits on the Throne of Peter – No Seer on Earth has been asked to write to a Pontiff who is also on the road to perdition, to ask him to heed the Word of his Holy Mother and My Divine Son, Jesus – Do not continue on the path that Satan has inspired you; do not be influenced by the power of the Antichrist who will in the end destroy you, for he is from the Underworld – not of the flesh as you can see, but demonic. Dear Holy Father Pope Francis, Peace be with you in the Name of Jesus and Mary! In 1985 I met Pope John Paul II in a Private Audience, invited by him, where he acknowledged my Mission and Blessed me, telling me to continue with the work Heaven had given me. I formed a Religious Order called the Order of Saint Charbel. The Rule and Constitution was handed to the Sacred Congregation for Religious in 1996, under the New Form of Consecrated Life. Holy Father Francis, as Mary Our Holy Mother – yours and mine – has asked me to write, I do so. Over the years I, like millions of other souls, have kept a close eye on all that you say and do with great interest. Jesus and Mary love you so very much, but always remember God sees all. It is not for me to judge you or any soul, as I – like you – am simply the servant of Christ.